Heat oil in 10-inch skillet over medium heat. Cook fish in oil about 8 minutes, carefully turning once, until fish flakes easily with fork. Remove fish from skillet; keep warm. Drain oil from skillet. Melt butter in same skillet over medium heat. Cook walnuts in butter, stirring frequently, until golden. Remove walnuts from skillet. Stir cornstarch and salt into butter remaining in skillet. Stir in broth, orange juice and basil. Heat to boiling, stirring constantly. Boil and stir 1 minute. Carefully stir in kiwifruit until coated. Spoon sauce over fish. Sprinkle with walnuts. Serve over rice. 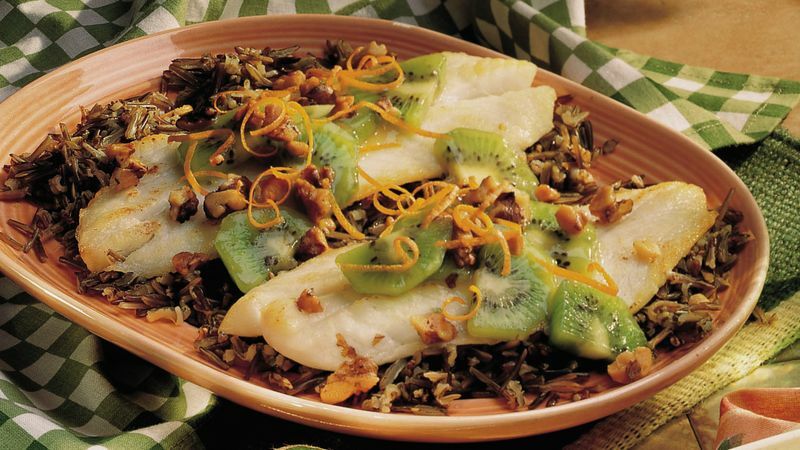 Cook white or wild rice the night before you plan to serve it, and refrigerate it in a microwavable casserole. Reheat rice in the microwave just before serving. If orange roughy is not available at your supermarket, substitute perch, cod or haddock.